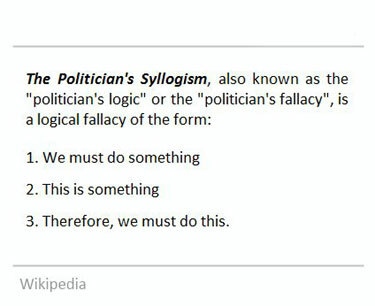 3 Feedbacks on "The Politician’s Syllogism"
Liberal: In order make children safer I will burn incense pots on every street corner. Conservative: That’s a pretty dumb idea. Liberal: Why do you want children to be less safe? I have never seen burning pots of incense at any scene of mass murder, therefore they must deter it. Let the whole country burn incense furiously and those who refuse simply want children to die. As an additional benefit, since I have begun burning lots of incense at every corner of my home, there have been no elephants mucking around in my garden!